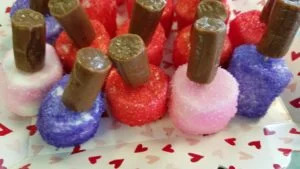 We made this cute nail polish treats for a little girl’s spa day. They were a big hit. The girl’s ages range from 5-11. They were so easy to make and looked just like nail polish. We made them in 3 colors red, pink and purple. 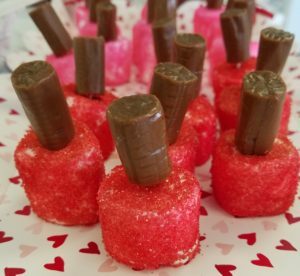 If you are having a little girl’s party, tea party, spa day, sleepover or even a play date, these adorable snacks will surely be a crowd-pleaser. The parents were even impressed with these cute treats. Follow the step-by-step directions below to make your very own nail polish treats. Step 1: Place a piece of parchment paper on the table. Pour some of your sanding sugar onto the paper. Step 2: Using your spray bottle, lightly spray all sides (except bottom) of your marshmallow. The marshmallows only need to be slightly wet. Step 3: Roll your marshmallow into the sanding sugar. You want a light coat of sanding sugar on your marshmallow. Make sure all sides of your marshmallows are covered including the top. You do not need to cover the bottom. 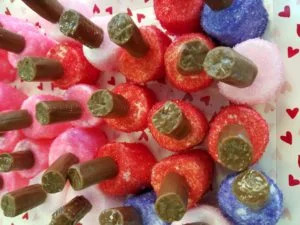 Step 4: Your Tootsie Rolls will act as the nail polish’s top. To make the top, break your tooth picks in half. Place one end into the Tootsie Roll and the other into your marshmallow. Step 5: Repeat steps 1-4 until you have a desired amount to nail polish treats. Make a variety of colors by using different colored sanding sugar. *Since the tooth picks are hidden in the snack, make sure your guests are aware that they are in there to avoid choking or injury. *Nail Polish treats are better if they are made the day of your event. If you need to make them early only do the night before. Do not store completed nail polish treats in the refrigerator. Refrigeration will make the marshmallows harden.